Applications to attend the inaugural TEDxUOregon, to be held Feb. 9 in the Global Scholars Hall Great Room, are now available on the event's website. TED rules limit attendance at the event to 100 people, and will select ticket recipients from among all who apply for tickets, rather than award them on a "first to snap up the tickets, first served" basis. Selections will be based on a variety of factors to help ensure a mix of students, faculty, staff and community members. 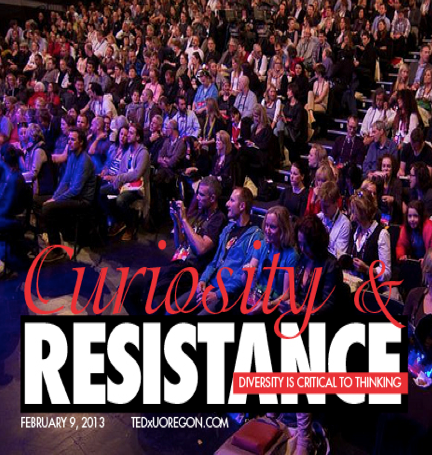 The event, sponsored by the UO's Center on Diversity and Community (CoDac), centers on the theme of “Curiosity & Resistance: Diversity is Critical to Thinking.” Seven speakers will explore the diverse nature of the UO campus, and the innovation and curiosity that describe the Pacific Northwest. Their talks will include biodiversity, pioneering the way for female fighter pilots and ensuring successful education through diversity. The TEDx talks will also be live-streamed free at the UO's Mills International Center, Living Learning Center, Ford Alumni Center Room 202, Allen Hall Room 221 and the White Stag Building in Portland. Because TED rules also limit attendance at each satellite site to 100, free tickets will be issued for those locations.